There are many different ways to whiten your teeth, but we recommend professional whitening offered through a dentist in order to protect your teeth and get the best results. We will complete a gel whitening treatment during a scheduled visit, and then provide a take-home whitening treatment and detailed instructions to give you the best whitening results possible. If you are unsure about whitening treatments because of tooth sensitivity, we have the capability of altering the treatment plan to still provide whitening results without causing added pain due to sensitivity. Invisalign is a teeth-straightening system that works by wearing custom, changeable retainers, and can be used instead of metal braces. You will change trays approximately every two weeks, which will gradually and gently shift your teeth into place based on exact movements planned out by us. Best of all, your retainers are made of a thin, smooth, virtually invisible plastic that is simply worn directly over your teeth. 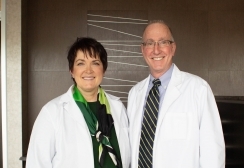 Dr. H and Dr. ML are both certified Invisalign providers, and would be more than happy to talk with you about the Invisalign process and the lasting effects it will make on your smile. For more information about Invisalign and the straightening process, click here. Veneers are “caps” made from composite material or dental porcelain, which are placed over the front of your existing teeth to protect them from damage and/or improve the look of your smile. These composite caps, or shells, allow you to change the color, shape, size, or length of your existing teeth. After the veneers are created in our lab to match your exact color and size specifications, a thin layer of enamel is removed from your teeth to allow the veneers to fit correctly, and then they are bonded to your teeth. If you are considering veneers, please contact us to schedule a consultation. Veneers are not right for every smile, so we would love to discuss your options and help you decide if veneers are the best option for you. Lumineers are ultra-thin porcelain veneers that are placed over your natural teeth without any excessive drilling, sensitivity problems, or shots. Lumineers are also completely reversible, are proven to last for twenty years, and give you a permanently white smile. Lumineers are easily placed within two visits. 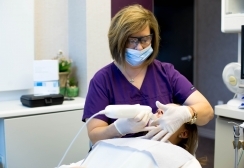 We will take precision molds during your first visit and have the lumineers created in our dental lab. On your second visit, the lumineers are placed, checked for fit and shade, and then attached to your original teeth.